Our utility is leading by example in the area of green vehicle technology. Through our support for the use of plug-in hybrid electric vehicles (PHEVs) and neighborhood electric vehicles (NEVs), we have made a commitment to reduce environmentally harmful exhaust emissions. 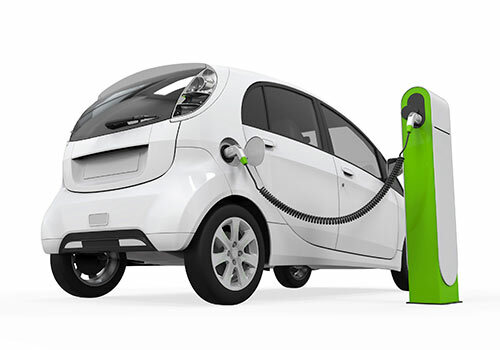 A hybrid electric vehicle (HEV) is a compromise between a standard gas-powered car and an electric vehicle, combining the long driving range and speed benefits of gasoline engines and the economic and environmental benefits of electric motors. HEVs have smaller engines than conventional cars. The vehicles store and use electricity generated from the gas engines, reducing the amount of gasoline needed to power the vehicle. The engine also generates power for the electric motor and is capable of recharging the electric motor’s battery at higher speeds. Therefore, the regenerative features of the car make its use of gasoline more efficient, extending the miles per gallon and reducing emissions. The electric motor of an HEV handles normal stop-and-go travel and initial highway acceleration. When the vehicle hits higher speeds, the gasoline-powered engine kicks in. The HEV’s battery feeds power to the electric motor and is able to recharge when the vehicle is coasting and braking. The power-switching process the vehicle undergoes between the two types of engines enables the vehicle to use less gasoline and reduce pollution. Using the same technology as standard hybrids, a PHEV is a hybrid that is fitted with an additional battery, allowing the vehicle to be recharged from a standard 120-volt electrical outlet. The battery takes approximately five hours to charge in a standard outlet, which would cost the average electric customer less than 50 cents. How is a PHEV different? PHEVs have traditional fuel tanks and internal combustion engines, so they do not face the range limitation of electric-only cars. PHEVs can travel up to 30 miles on electricity before using the standard, gas-electric operating system and get up to 100+ miles per gallon. PHEV owners can expect up to an 85 percent reduction in gasoline use. PHEVs also get about twice the fuel economy of a conventional vehicle and 30-50 percent better fuel economy than a standard hybrid. The electric equivalent of a gallon of gas costs less than $1 a gallon. Greenhouse gas emissions are significantly reduced with both HEVs and PHEVs. NEVs are compact vehicles designed to be used in residential areas with low density traffic and low speed zones. With a top speed of 30-35 mph, low-speed vehicles can be used on streets with a posted 35 mph speed limit or less. When driven on public streets, a driver’s license is required. The green vehicles are powered by rechargeable batteries and electric motors. Depending on the size and options, a full battery charge will take between 8 to 10 hours. Are Plug-in Hybrids available today? Yes, there are many models of PHEVs on the roads today. There are also many conventional hybrids, from sedans to SUVs, that have been converted to plug-ins. Some are getting up to 60 all-electric miles per charge. How much gasoline does a PHEV use? According to the Electric Power Research Institute (EPRI), half the cars on U.S. roads are driven 25 miles a day or less. Consequently, a plug-in with a 25-mile all electric range could eliminate gasoline use in the daily commute of tens of millions of Americans. Furthermore drivers of PHEVs would only need to fill up with fuel a few times a year, versus the current 24-36 times a year on average. No. They have essentially the same accelerating power and speed capability of current hybrids. How much more will a PHEV cost than a conventional hybrid? On average, the cost of a PHEV battery adds about $2,000 to $3,000 to the cost of a conventional hybrid. Find more details about PHEVs here.